Here's an octahedron in Stella, using a 3-view layout featuring the octahedron itself, the unfolded net, and a partially folded net. See more screenshots here. Here is a compound of the octahedron with its dual. Notice how the cube's vertices sit above the octahedron's faces, and vice versa? Also the edges of the two polyhedra bisect each other at right-angles. Multiple octahedra can be arranged in an intersecting manner to form various compounds. Here is the best known one consisting of 5 intersecting octahedra. It is also a faceting of the icosidodecahedron and a stellation of the icosahedron. 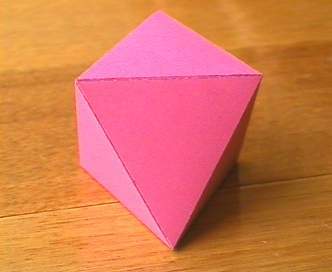 The octahedron has just one stellation. This is also a faceting of the cube and a compound of two tetrahedra.